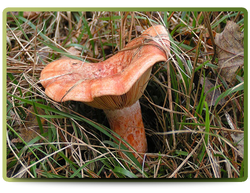 The Pine Ring mushroom, also known as the Saffron milk cap, is one of the best known members of the large milk-cap genus. It is orange in colour and has a convex cap. The cap is in-rolled when it is still young. The cap size can vary from 4 to 14 centimeters across and often has darker orange concentric circle markings. The gills appear to be crowed and the hymenium is decurrent with an orange stipe which is often hollow - depending on its size.. The stipe length can vary from 3 to 8 centimeters and 1 to 2 centimeters thick. When handling a Pine ring mushroom, it stains dark green in colour. 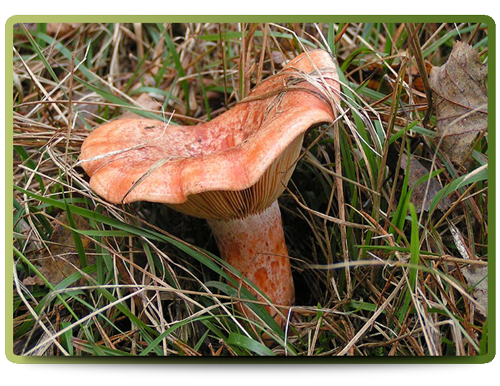 If you cut the mushroom when it is still fresh, it exudes an orange-red "milk". "There are old mushroom hunters and there are bold mushroom hunters, never both." "All mushrooms are edible, some only once." ©2019 Mushroom Guru™ (Pty) Ltd.
Mushroom Guru™ ​ (Pty) Ltd.